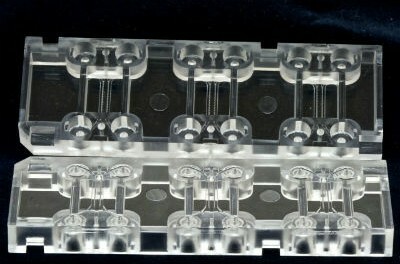 AIM Biotech’s microfluidics device (shown here) has an array of culturing sections, each with three chambers: a middle chamber for hydrogel and any cell type, and two side channels for culturing additional cell types. Now MIT spinout AIM Biotech has developed a microfluidics device — based on years of research — that lets researchers co-culture multiple cell types in a 3D hydrogel environment that mimics natural tissue. Other systems for 3D cell culturing involve filling deep dishes with hydrogels. Because of the distance these dishes must be kept from the microscope, Kamm says, it’s difficult to capture high-resolution images. AIM Biotech’s devices, on the other hand, he says, can be put directly under the microscope like a traditional plate, which is beneficial for imaging. In AIM Biotech’s microfluidics device, liver cancer spheroids can be co-cultured with endothelial cells (shown here). In the body, cells break loose from a tumor and migrate through tissue into the blood system, where they get stuck in the small blood vessels of a distant organ or adhere to vessel walls. Then they can escape from inside the vessel to form another tumor. AIM Biotech’s microfluidics device produces a similar microenvironment: When endothelial cells are seeded into the side channels or the central gel region, they form a 3D network of vessels in the hydrogel. Tumor cells can be introduced, flowing naturally or getting stuck in the vessels. In a study published in Integrative Biology, MIT researchers used Kamm’s microfluidics technology to screen several drugs that aim to prevent tumors from breaking up and dispersing throughout the body. Results indicated that the level of drugs needed was often two orders of magnitude higher than predictions based on traditional assays. “So there’s no way to effectively predict, from the 2-D assays, what the efficacy of a particular drug was,” Kamm says.